I've tried to steer away from discussions on the political happenings in the Israeli-Arab conflict, but the past day's events are too good to let pass. I'm not talking about the rogue Israeli-Arab laborer who rampaged through the streets of Jerusalem in a bulldozer. 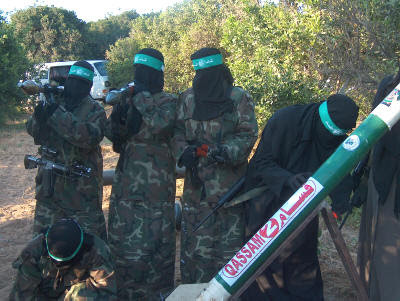 I'm talking about the rockets that have been fired into Israel since this supposed peace between Hamas and Israel has been in effect. As per the agreement, in short, as long as the rocket attacks from Gaza cease, Israel will keep open the border crossings. No rockets = food & fuel. So, what happens only a few days after the cease-fire goes into effect? You guessed it... rockets fall on Israel. The past few months we've heard over and over how dire the situation in Gaza has been. Due to Hamas terrorist rule, and the ensuing barrages of rockets landing on Israel, we have been forced to close the borders between Israel and Gaza, and unfortunately for the Gazans, Egypt followed suit on their side of the border. Gaza does have it bad, and it would be a lie to say otherwise. And this truce would be the greatest thing for the Arabs of Gaza right now. However, it seems that the militant groups living in that region - which is a substantial sector, believe me - either do not agree, don't care, or what I believe to be the truth, they benefit from conflict. You see, the more Israel looks bad, the more innocent civilians join the ranks of Islamic Jihad, Hamas, or any other terrorist organization. The longer Israel keeps the borders closed, keeps the food, fuel, and even tax money out, the more villified us 'Zionist pigs' become; the richer terrorists become. but not before Israel spends the day transferring seventy trucks worth of supplies to the innocent civilians betrayed by their own people. I'd say I'm getting tired of our neighboor's foolishness, but this is what I predicted a week ago.